Thousands have marched in Hong Kong to mark the forthcoming 20th anniversary of the Tiananmen killings, in one of the few such events on Chinese soil. Hundreds, possibly thousands, of people were killed in China's crackdown on pro-democracy protests. There has been no official inquiry so the exact death toll remains unclear. Among the crowds in Hong Kong on Sunday was Xiong Yan, a leading student protester during the 1989 demos, now living in exile in the US. He was admitted into Hong Kong on Saturday, to his surprise, he told AFP news agency, having been turned back on several previous occasions. He told cheering crowds: "I feel like I have returned home." Many at the protest wore black and white, to symbolise mourning. Police said at least 4,700 people had gathered. Tens of thousands more are expected to attend a candlelit vigil on Thursday. 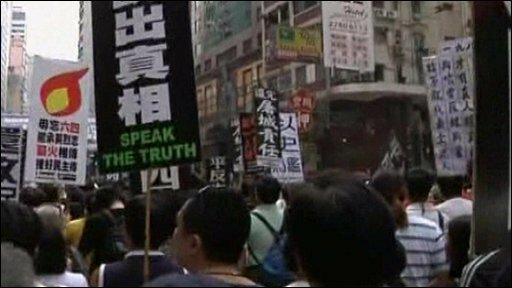 China still considers the Tiananmen protests "counterrevolutionary", but they are openly marked each year in Hong Kong because it is ruled under a separate political system. Many of those taking part in the events see the occasion as vital to the preservation of Hong Kong's freedom of speech. "June 4 was a time when a group of people sacrificed their lives for democracy. We need to remember their efforts," said demonstrator Steve Chan. James Miles: Was the media right? Has China changed after Tiananmen?